Description: This document describes the draft application profile for collection-level description developed by the Dublin Core Collection Description Working Group. Note : This document presents full details of the application profile. For a summary view, see the Dublin Core Collections Application Profile Summary [APS]. The set of terms used in a class of DC metadata description sets. the properties referenced in statements in those descriptions, and how those properties are used to describe resources of the specfied type. The terms description set, description, property, value, vocabulary encoding scheme, value representation, rich representation, value string, syntax encoding scheme, and related description are used in the sense they are used in the DCMI Abstract Model [DCAM]. This document is not a description of an XML format. There may be multiple bindings of this DCAP, to XML and to other syntaxes. The term "collection" can be applied to any aggregation of physical and/or digital resources. Those resources may be of any type, so examples might include aggregations of natural objects, created objects, "born-digital" items, digital surrogates of physical items, and the catalogues of such collections (as aggregations of metadata records). The criteria for aggregation may vary: e.g. by location, by type or form of the items, by provenance of the items, by source or ownership, and so on. Collections may contain any number of items and may have varying levels of permanence. 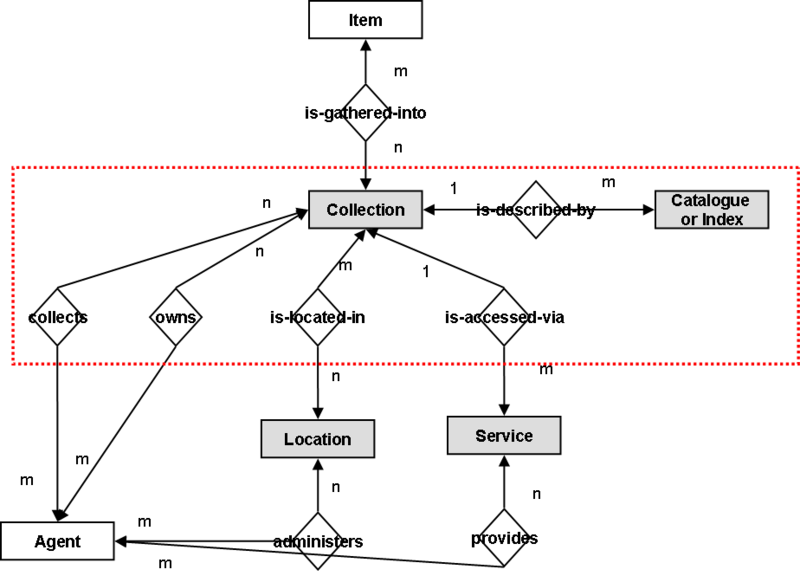 A "collection-level description" provides a description of the collection as a unit: the resource described by a collection-level description is the collection, rather than the individual items within that collection. Collection-level descriptions are referred to in Michael Heaney's An Analytical Model of Collections and their Catalogues as "unitary finding-aids" [AMCC]. The DC Collections AP specifies how to construct a DC metadata description set that provides a collection level description. It provides a means of creating simple descriptions of collections suitable for a broad range of collections, as well as simple descriptions of catalogues and indexes. Aggregations of physical or digital resources (collections) and aggregations of the metadata that describe them (catalogues and indices) can be described with similar properties. They are created by a collector, they have an accrual periodicity etc. They are related to each other because the aggregations of physical or digital resources (collections) can be described by one or more metadata aggregations (catalogues or indices). In order to distinguish the use of this DCAP either for collections or for catalogues or indices, the application of each property has been described for each case. The DC Collections AP is intended to provide a means of creating simple descriptions of collections and catalogues or indices suitable for a broad range of collections. It is designed primarily to support the discovery and selection of collections, though it may be used to support other functions such as collection management too. It is not intended to describe every possible characteristic of every type of collection. Collection An aggregation of Items. Item A physical or digital resource. Location A place where a Collection is held. Catalogue or Index An aggregation of Items which describes a Collection. The DC Collections AP describes the use of properties to represent attributes of the collection and of the catalogue or index, and relationships between collections, between collections and catalogues or indices, and between collections, catalogues or indices and other entities. It does not describe how to represent attributes of other entities in the model. the Owner [marcrel:OWN] property (owns). The relationship between a collection and its location is recorded in the Is Located At [cld:isLocatedAt] property. The relationship between a collection and an access service is recorded in the Is Accessed Via [cld:isAccessedVia]. Figure 2 summarises the relationship between a collection and catalogue or index and their constituent items. The relationship between an item in the catalogue or index and an item in the (described) collection varies depending on the nature of the catalogue or index. In some cases, there may be fairly simple correspondences between items in the catalog or index and items in the described collection; in other cases the metadata items in the catalog or index may describe groupings of items within the described collection as well as individual items, or indeed the individual items may not be described at all. Further, a catalog or index which is itself a collection may be described by a second catalogue or index. A description set conforming to this DCAP must contain at least one description of a collection. It may contain descriptions only of collections and catalogues or indices, or it may also include descriptions of resources of other types, related to those collections or catalogues or indices, which are referred to as values in statements about the collections or catalogues or indices. Such other resources might include the location of a collection, the services that provide access to a collection, concepts that are the subject of a collection, and agents related to the collection or catalogue or index. While this DCAP permits the inclusion of descriptions of those related resources in a description set, it does not specify the terms to be referenced in descriptions of resources other than collections and catalogues or indices. The metadata terms referenced in the DC Collections AP are drawn from the DCMI metadata vocabularies and also from other metadata vocabularies owned by other agencies. The DC Collections AP is independent of any particular syntax for representing description sets. Description sets conforming to the DC Collections AP may be represented using any of the conventions recommended by DCMI for expressing DC metadata based on the DCMI Abstract Model. The two sections "Describing a Collection" and "Describing a Catalogue or Index " each describe how a set of terms (properties, classes, vocabulary encoding schemes, syntax encoding schemes) is used to construct a DC metadata description of a resource of the specified type. The first table in each of these sections describes the class, the type of resource, to which the metadata description applies. Class URI: The URI by which the class is referenced in a DC metadata description. Qualified Name for Class: The Qualified Name which is typically used as an abbreviation for the class URI. Defined By: The name and identifier of the metadata vocabulary from which the class is drawn. Subclass Of: Class of which the current class is a subclass. Label: The short label provided for the class by its owner/maintenance agency. Definition: The definition provided for the class by its owner/maintenance agency. Comments: Additional information about the class provided by its owner/maintenance agency. See Also: A resource which provides further information about the class. Property URI: The URI by which the property is referenced in a DC metadata description. Qualified Name for Property: A unique name/identifier for the property. It is presented as a Qualified Name, but is an abbreviation for the property URI. Defined By: The name and identifier of the metadata vocabulary from which the property is drawn. Subproperty Of: A property of which the current property is a subproperty. Source Label: The short label provided for the property by its owner/maintenance agency. Label in this DCAP: A short human-readable label that provides an indication of how the property is to be used in a DC metadata description of a resource of the specified type. The label does not appear in the description. It _may_be used to provide a descriptor for fields in displays of descriptions to human readers, but there is no requirement for display applications to use this label. Source Definition: The definition provided for the property by its owner/maintenance agency. Comments for this DCAP: Additional information about the use of the property in a description of a resource of the specified type, typically on the values and their representation. Uses Vocabulary Encoding Scheme: The unique names/identifiers of vocabulary encoding schemes from which values for the property should be drawn. Names are presented as Qualified Names, but are abbreviations for URIs. The URI is used to refer to the vocabulary encoding scheme in DC metadata descriptions. If no vocabulary encoding scheme is listed, then the DCAP does not specify a vocabulary encoding scheme from which values should be drawn. However the definition and usage of the property may determine that values of only certain types are appropriate. For example, the value of the dc:creator property must be an entity capable of action. Syntax Encoding Scheme(s):The unique names/identifiers of datatypes from which value strings for the property should be drawn. Names are presented as Qualified Names, but are abbreviations for URIs. The URI is used to refer to the datatype in DC metadata descriptions. If no datatype is listed, then the DCAP does not specify a datatype from which value strings should be drawn. Note : For each value, at least one of the following components must be present: a value URI, a rich representation, a value string or a (related) description. The following two sections describe the vocabulary encoding schemes and syntax encoding schemes referenced in the previous two sections. Vocabulary Encoding Scheme URI: The URI by which the vocabulary encoding scheme is referenced in a DC metadata description. Qualified Name for Vocabulary Encoding Scheme: The Qualified Name which is typically used as an abbreviation for the class URI. Defined By: The name and identifier of the metadata vocabulary from which the vocabulary encoding scheme is drawn. Label: The short label provided for the vocabulary encoding scheme by its owner/maintenance agency. Definition: The definition provided for the vocabulary encoding scheme by its owner/maintenance agency. Comments for this DCAP: Additional information about the use of the vocabulary encoding scheme in this DCAP. See Also: A resource which provides further information about the vocabulary encoding scheme. Used as Vocabulary Encoding Scheme For: The type of resource and the property for which the vocabulary encoding scheme provides values. Syntax Encoding Scheme URI: The URI by which the syntax encoding scheme is referenced in a DC metadata description. Qualified Name for Syntax Encoding Scheme: The Qualified Name which is typically used as an abbreviation for the class URI. Defined By: The name and identifier of the metadata vocabulary from which the syntax encoding scheme is drawn. Label: The short label provided for the syntax encoding scheme by its owner/maintenance agency. Definition: The definition provided for the syntax encoding scheme by its owner/maintenance agency. Comments for this DCAP: Additional information about the use of the syntax encoding scheme in this DCAP. See Also: A resource which provides further information about the syntax encoding scheme. Used as Syntax Encoding Scheme For: The type of resource and the property for which the syntax encoding scheme provides value strings. A collection is an aggregation of items. The term collection means that the resource is described as a group; its parts may be separately described and navigated. The nature or genre of the resource, i.e. dcmitype:Collection. The statement must assert that the resource is of type dcmitype:Collection. A URI for the collection. A collection identifier must be a URI, using a URI scheme that has been registered with IANA. The URI of the collection should be used as the resource URI of the description and also as the value string in a statement using the dc:identifier property. If multiple URIs are assigned to a collection, one of the URIs should be used as the resource URI, and each URI, including the resource URI, should be used as the value string in a separate statement using the dc:identifier property. A value string must be provided. To record titles in multiple languages, use multiple statements and in each statement associate the value string with the appropriate language tag. Any form of the name used as a substitute or alternative to the formal name of the collection. To record alternative titles in multiple languages, use multiple statements and in each statement associate the value string with the appropriate language tag. Values may include acronyms that are used in addition to the name of the collection. A free text summary description of the collection. To record descriptions in multiple languages, use multiple statements and in each statement associate the value string with the appropriate language tag. Although a description might contain detailed subject-specific information, at least part of the description should be understandable by an end-user with no specialist knowledge of the subject area. The size of the collection. A language of the items in the collection. A value string must be provided; a value URI may also be provided. The value string should be a language name in the form of the three character code defined by ISO 639-2. Where the collection covers multiple languages, a separate statement should be used for each language. The nature or genre of one or more items within the collection. Where the collection includes items of multiple types, a separate statement should be used for each type which is regarded as significant for a user of the collection description. The media type, physical or digital, of one or more items within the collection. Where the collection includes items of multiple media types, a separate statement should be used for each media type which is regarded as significant for a user of the collection description. A statement of any rights held in/over the collection. Either a value string or a value URI or both may be provided. To record information in multiple languages, use a single statement with multiple value strings and associate each value string with the appropriate language tag. A statement of any access restrictions placed on the collection, including allowed users, charges, etc. A method by which items are added to a collection. Recommended best practice is to use a value from the Collection Description Accrual Method vocabulary encoding scheme. Where multiple methods apply, a separate statement should be used for each method. A frequency with which items are added to a collection. Recommended best practice is to use a value from the Collection Description Frequency vocabulary encoding scheme. A policy governing the addition of items to a collection. Recommended best practice is to use a value from the Collection Description Accrual Policy vocabulary encoding scheme. Where multiple policies apply, a separate statement should be used for each policy. A statement of any changes in ownership and custody of the resource since its creation that are significant for its authenticity, integrity and interpretation. A statement of any changes in ownership and custody of the collection that are significant for its authenticity, integrity and interpretation. A class of entity for whom the collection is intended or useful. Where a collection is intended or useful for multiple audiences, a separate statement should be used for each audience. A subject or topic associated with the items in the collection. Keywords or subject descriptors associated with items in the collection. The terms used indicate the subject matter of the collection. The vocabulary encoding schemes below are those recommended by DCMI. Other appropriate vocabulary encoding schemes may be used, and the use of a scheme must be indicated. Where multiple keywords or subject descriptors are provided, a separate statement should be used for each keyword or descriptor. An indicator of the spatial scope of the collection. Where descriptors of multiple spatial locations are provided, a separate statement should be used for each descriptor. An indicator of the temporal scope of the collection. A range of dates over which the collection was accumulated. A date range should be supplied in the form described by RKMS-ISO8601. Start dates and end dates should be in the form of a date or date-time combination as specified by W3CDTF. Start dates and end dates should be separated by a solidus (forward slash) (/). Either the start date or the end date may be omitted to indicate an open-ended date range. indicating, '1888 to 1894', '1960 onwards', 'up until 1960' and 'February 2000 to 18 June 2000' respectively. Where multiple ranges are required, a separate statement should be used for each range. A range of dates over which the individual items within the collection were created. Source Definition An entity primarily responsible for making the resource. An entity who gathers (or gathered) the items in a collection together. The value string should be the name of the entity. The person or organization that currently owns an item or collection. An entity who has legal possession of the collection. A location where the collection is held. A service that provides access to the items within the collection. A second collection contained within the current collection. A second collection that contains the current collection. The second collection may be an analytic finding aid or indexing finding aid. A second collection that is associated with the current collection. A publication that is based on the use, study, or analysis of the collection. A human-readable citation for the publication should be provided; a machine-readable citation in the form of an OpenURL Context Object may be provided. The nature or genre of the resource, i.e. cdtype:CatalogueOrIndex. The statement must assert that the resource is of type cdtype:CatalogueOrIndex. A URI for the catalogue or index. A catalogue or index identifier must be a URI, using a URI scheme that has been registered with IANA. The URI of the catalogue or index should be used as the resource URI of the description and also as the value string in a statement using the dc:identifier property. If multiple URIs are assigned to a catalogue or index, one of the URIs should be used as the resource URI, and each URI, including the resource URI, should be used as the value string in a separate statement using the dc:identifier property. The name of the catalogue or index. A free text summary description of the catalogue or index. The type of the catalogue or index. The size of the catalogue or index. A language of the content of the items in the catalogue or index. Where the catalogue or index covers multiple languages, a separate statement should be used for each language. The nature or genre of one or more items within the catalogue or index. Where the catalogue or index includes items of multiple types, a separate statement should be used for each type which is regarded as significant for a user of the catalogue or index description. The media type, physical or digital, of one or more items within the catalogue or index. Where the catalogue or index includes items of multiple media types, a separate statement should be used for each media type which is regarded as significant for a user of the catalogue or index description. A statement of any rights held in/over the catalogue or index. A statement of any access restrictions placed on the catalogue or index, including allowed users, charges, etc. 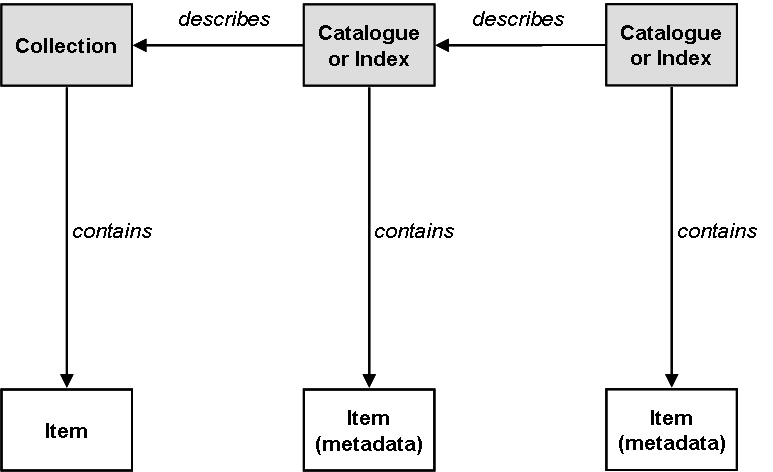 A method by which items are added to a catalogue or index. A frequency with which items are added to a catalogue or index. A policy governing the addition of items to a catalogue or index. A statement of any changes in ownership and custody of the catalogue or index that are significant for its authenticity, integrity and interpretation. A class of entity for whom the catalogue or index is intended or useful. Where a catalogue or index is intended or useful for multiple audiences, a separate statement should be used for each audience. A range of dates over which the catalogue or index was accumulated. A range of dates over which the individual items within the catalogue or index were created. An entity who gathers (or gathered) the items in a catalogue or index together. An entity who has legal possession of the catalogue or index. A location where the catalogue or index is held. A service that provides access to the items within the catalogue or index. A second catalogue or index contained within the current catalogue or index. A second catalogue or index that contains the current catalogue or index. A second collection that describes the current collection. A second catalogue or index that describes the current catalogue or index. The second catalogue or index may be an analytic finding aid, hierarchic finding aid or indexing finding aid. A second collection that is described by the current collection. A second collection that is described by the catalogue or index. ISO 639-2: Codes for the representation of names of languages. A set of methods by which items are added to a collection. A set of frequencies with which a repeatable event occurs. Library of Congress Subject Headings. A list of types that categorize a collection description. Instances of this datatype are dates or periods of time represented as literals according to the rules specified in Recordkeeping Metadata Schema Extension to ISO8601. A description set conforming to this profile should itself be described by an appropriate administrative metadata description. This document does not specify the properties to be used in that administrative metadata description. 1. This model is derived from that described in Michael Heaney's An Analytical Model of Collections and their Catalogues [AMCC] and Users and Information Resources: An Extension of the Analytical Model of Collections and their Catalogues into Usage and Transactions [EAMCC]. It is both a subset and a simplification of that model. Incorporated parts of the "Collections and Collection-level description" section and removed the remainder. Clarified the "Use of the DC Collection AP for collection descriptions" to indicate that this was "Use of the DC Collection AP for catalogues or indices" and made subsequent changes to the document. Revised "Data Model" section to better explain the data model, and to set apart the DCCAP data model from the AMCC and EAMCC. Aligned dcterms in AP with current definitions.